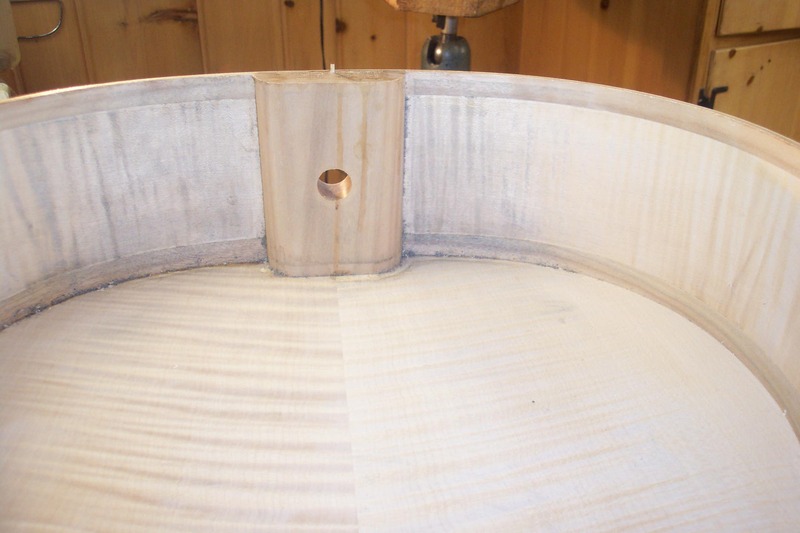 A number of years ago I wrote an article for Strings Magazine stressing the importance of maintaining proper moisture content in the wood of your instrument. I'm back on my soapbox, because this still seems to be a subject that's not very well understood. I also have new information on specific methods and products which will make it fairly easy to maintain proper moisture levels. Let me go over the basics once again. Wood is an organic material which exchanges moisture with the surrounding air. It swells and contracts depending on it's moisture content, and it's moisture level depends directly on the moisture in the surrounding air. This change in shape and size puts tremendous stress on the instrument. When it gets smaller, parts of the instrument like the top are under tension, the perfect condition for the formation of cracks and failure of the joints and seams. When it gets larger, joints and seams can also fail, and at high moisture levels, the resistance of wood to bending and to permanent deformation goes way down. Heat and moisture were used by the maker to bend the ribs on your instrument, so you can understand how excessive moisture can result in permanent distortion of the top and a permanent sagging of the neck height. So the dimensions and strength of the wood change with moisture content, but did you know that the weight of the wood also changes significantly? No wonder the sound of instruments changes with moisture content. These factors, weight, dimensions and strength are the very factors that instrument makers manipulate to control how their instruments sound in the first place! I'm going to refer a number of times in this article to Taylor Guitars, because they seem to have a great deal of consumer-oriented information on this subject, and they've been browbeating their customers and dealers about this for years the same way I have. According to Taylor, a guitar returned to them from a wet and rainy area lost 38 grams in weight when it was allowed to normalize to its original moisture content in their factory. They further state that 38 grams of water is enough to saturate four large, highly absorbent paper towels! If you buy a Taylor guitar, you'll find that they include five pages of tech sheets stressing how important it is to maintain proper humidity, and outlining all the things that can go wrong if you don't. They claim that a guitar top will change in width about 1/8 inch with a 20% change in humidity. Imagine the change in dimension on a larger instrument, like a cello or a bass? Not good! . The very best thing would be to keep humidity in the environment at one level all the time, like museums do. As a practical matter in the real world though, I recommend a range from 40% to 60%. How do you measure your humidity? Usually with a device called a hygrometer. I've seen a number of them from the same manufacturer though, on the same shelf, with readings all over the place. Yes, the digital ones too! I've tested probably 50 hygrometers, and ONLY ONE was within two percent of the correct reading. 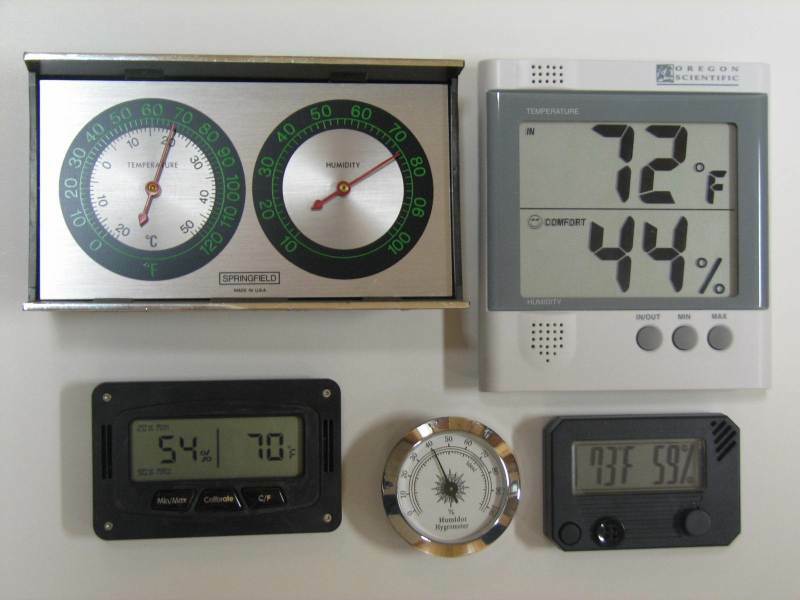 A hygrometer that isn't accurate is worse than useless; it's a hazard to your instrument! The photo below shows the accuracy problems with hygrometers. Beginning at the upper left corner, they read 75, 44, 54, 40, and 59 percent humidity. These were all photographed at the same time, in the same environment. The one on the lower right is the one with the correct reading. The one on the lower left is another brand which can be calibrated, and I tested it because it looked promising. Immediately after calibration, it was pretty good, but several months later, it ranges between 5 and 9% off. Even more troubling is that the recalibration button in the center is easily pushed accidentally during normal handling. It happened to me several times. If that happens, you will be left with readings which may be wildly off, with no warning that they have changed. I talked to the manufacturer about making a small design change to correct this flaw, but they didn't seem to be interested. Where can you get tested, confirmed accurate hygrometers? See the sources at the end of the article. I'm not currently aware of other sources. If you want to do a rough check on the accuracy of your hygrometer, you can find instructions for doing this using common table salt and water at the link directly below. Remember though, this will only tell you if your hygrometer is accurate at 75%. It could be way off at other levels. I believe that the best way to protect your instrument is to control the humidity either in the whole building, or one room of the building, such as the one you use as a studio, music room or practice room. I'm most excited about the 1 room setup, which I think will be the most useful to the greatest number of people. The main reasons? Since adding or removing moisture requires energy, it should be obvious that controlling the humidity in one room will cost the least. There is also less risk of mold and structural problems due to condensation that might result from humidifying an entire house to 40% in a very cold climate. This one room system outlined here is the least expensive, and requires the least maintenance of anything I've tried. Here's the setup for controlling one room, which is suitable for controlling humidity in a small shop, a teaching studio, hotel room, practice or music room, or an instrument storage room. I've used this setup in my instrument making studio for over 12 years. The central component of this system is the separate control unit. Your humdidfier or dehumidifier can be plugged into these, and these take over control of the appliance. Many humidifiers and dehumidifiers on the market have a humidistat built in, but I have found that many of these aren't very accurate. The main problem seems to be that the sensing element is too close to the source of the moisture or heat, and doesn't sense the overall level in the room very well, allowing moisture fluctuations as high as 30% in my testing. The separate controller can be located far enough away from the humidifier or dehumidifier to actually measure the moisture in the room air, and not the air in close proximity to the moisture modifying device. Sources for the controllers are at the end of the article. IMPORTANT: Since these controllers work by turning power to the appliance on and off, they will only work on appliances which maintain their settings in spite of a power interruption. But choosing such an appliance is a good idea anyway, whether you use a separate controller or not. You wouldn't want to be gone for a few days, and come back to find that your appliance wasn't doing its job while you were away, or that your humidifier had been running continuously, all because of a momentary power outage! For producing moisture, I like the "warm mist" Sunbeam 1388 series, available for about 20 dollars. It holds a little more than gallon of water, lasting several days in my workshop under most winter conditions. If outside temperatures are around zero, I might have to fill it once per day. The last cheap Sunbeam vaporizer I purchased lasted about eight years. Vicks has similar steam-type humidifiers, but my experience is that they don't put out as much steam or last as long. Why do I like the steam type? First, these vaporizers are cheap. If it gets a buildup of minerals after a year or two and stops working, just throw it away and buy a new one. Your separate control unit is still good, and you don't have to pay for a new control unit like you would when you replace the humidifiers that have one built in. Second, because these are steam type vaporizers, they emit a sterile, distilled water vapor, and don't have filters, wicks or pads which can be a good culture medium for mold and bacteria, and which need to be replaced periodically. These replacement parts typically cost as much as the complete Sunbeam unit. Third, they don't have a fan or any other moving parts, and are usually quieter than any other kind of vaporizer or humidifier. Fourth, the same control unit you use for this will also control your dehumidifier, if you get the more expensive of the two models. There are a number of small dehumidifiers which are inexpensive, Energy Star rated, and have good consumer ratings. I've had some fail in short order though. The one I have found to be the most reliable so far is a Frigidaire 30 pint model, about $150 from various internet sources. The biggest shortcoming of most I have tried? As with many humidity control products on the market, the built-in controllers didn't keep actual room humidity levels very stable. No problem. Adjust the units to their lowest humidity setting, and plug them into your universal controller, which can also be used for the vaporizer. If you purchase a dehumidifier with sufficient capacity and switch your furnace fan on to run continuously, you can even use this setup to dehumidify your whole house. Since mold is being increasingly recognized as a toxin and needs moisture to grow, this could have health benefits as well. If you dehumidify to 60%, that should be sufficient for the health of your instrument. Many of these dehumidfiers have provisions for a drain hose, so one doesn't need to empty the reservoir if there's a drain nearby, at a lower level than the dehumidifier. They can be a little noisy (even on the lowest fan setting), but if the lowest fan setting isn't quiet enough, one can turn it off completely for practice or lessons, and most will retain the settings upon turning it back on. Just don't forget to turn it back on. Another option is to have a humidistat wired in to turn your air conditioning on automatically when the humidity gets too high. This is a common approach in warm, humid Southern climates. If you live in the North, the air conditioner may make the house too cold by the time the moisture is removed, and you may have trouble finding a furnace contractor who even knows how to do this. As mentioned in the "one room" section above, another way is to buy a console type dehumidifier, and use it to dehumidify the whole house by running the furnace fan continuously to circulate the dried air. I have used and can recommend the AprilAire model 400 (about $170) or model 600 (about $150 plus installation). Both are whole-house humidifiers that attach to the furnace, and pass the water through only once to a drain on the bottom. Lennox (the same company that makes the thermostat) also sells humidifiers of this type. These "once through" types avoid the buildup of mold and bacteria that can occur in the types that recirculate the water, and then put this yuck into the air in your house! As I mentioned before, if you live in an area with cold winters, be very careful about humidifying the whole house to 40%. Moisture can condense on window frames and even inside cold walls, leading to the formation of mold and structural problems. If you are a maker, I must stress the importance of assembling an instrument under proper humidity conditions. If you assemble an instrument under very moist or dry conditions, there is a much greater chance of problems when it is sold to someone who takes it to the opposite environment. If it's assembled under medium conditions, it will hold up better if the user takes it to either extreme. Once again, I'll make a reference to Taylor guitars. In their literature, Taylor emphasizes that they keep their factory at 47 percent all the time. If you're making instruments that cost as much or more than theirs, I'd think that you would want to take at least as much care. Why do I like this setup much better than the "rubber tube" type humidifiers that go in the instrument? My biggest concern with these is that the user has to be VERY CAREFUL to make sure this device is not too wet before inserting it in the instrument, or it will drip. I've actually seen evidence of puddled water in the lower block area on several cellos where this was used. I had one open to repair cracked ribs in this area. This is a picture of the inside of a cello where a "snake" type humidifier was used, showing discoloration from dripping water. This is not uncommon. In addition, when these are used, there will always be a moisture gradient, with the wettest part of the instrument being closest to the tube. If the tube is in contact with the wood, this area could be close to 100%. And if you think these will keep an instrument humidified while you are playing, I'm sorry, but there is just too much air moving in and out of the instrument for them to make much difference. Humidifiers that humidify the inside of the case? As I stated in my last article, many of these don't release enough moisture to make a significant difference. There may be some newer systems on the market that are more effective, but don't rely on a case humidifier until you actually test it to make sure it does the job. None, to my knowledge, will automatically regulate the amount of moisture they put into the air. By the way, a case humidifier won't do you any good when the humidity is too high. What about when you take your instrument out of your controlled environment? Different instruments from different makers vary, but generally speaking, the wood in an instrument will take two or three days to gain or lose a really large amount of moisture. If you go to a rehearsal or performance, just try to get the instrument back in your controlled environment as soon as you can. If you travel, you could conceivably take your room humidifier with you, or you might need to use an in-the-case humidifier as a backup. What I recently discovered though is that many hotels have room humidifiers available upon request. Try to stay someplace with air conditioning if you go to a really humid climate. For the greatest accuracy, the controller should be located at least several feet from the vaporizer or dehumidifier, away from the air discharge, and should not be mounted on a cold outside wall, near a heat register, or where it is in direct sunlight. The vaporizer should be placed on a waterproof pan or mat, and located so that it discharges into an unobstructed area, well away from your instrument. Limit the exchange of air between your controlled room and the rest of the building by closing air registers as far as possible without sacrificing a comfortable temperature, and keep the door to the room closed. 1510 Glen Leven; Ann Arbor, MI 48103 U.S.A.